Blood Pressure Lowered by Chiropractic in many people! What an amazing 24 hours this has been. If you had asked me about this 10 years ago, I would have said this never would happen. In fact if you had asked me yesterday, I don’t would not have thought this would happen. I got an e-mail yesterday from Mark Wallace who runs the pain treatment center at the UCSD school of medicine. Mark is a world renouned researcher on pain, honestly one of the three smartest people I have ever met, a chiropractic advocate, and an all around wonderful guy. The e-mail alerted me to a study that just came out that showed a strong corolation between chiropractic and blood pressure. The study talks about how you have to do a special chiropractic adjustment that not every chiropractor can do. What they show in the video is that the chiropractor is separating the top vertebrae from the skull. You can do that with a few techniques, but yes, in my experience not all chiropractors do this successfully or consistently. The best way I have ever seen to accomplish that separation is from an adjustment invented by Leander Eckhardt that does the separation of the top vertebrae from the skull (about 1/4 inch) very comfortably if done properly, with very little force involved. Once someone is a patient in our office for a little while, I usually do that adjustment on them every visit. About 10 years ago we began to suspect that patients getting adjusted in our office had a drop in blood pressure, so we did our own informal chiropractic blood pressure study. What we did was by no means a double blind study on chiropractic and blood pressure. Really simply we saw that almost every patient I adjusted during this brief look had their blood pressure drop after an adjustment. If I checked them before and after getting adjusted, their blood pressure would drop around 15 points, which matches with the study. Again, ours was very informal, but so obvious that you could not deny the fact. 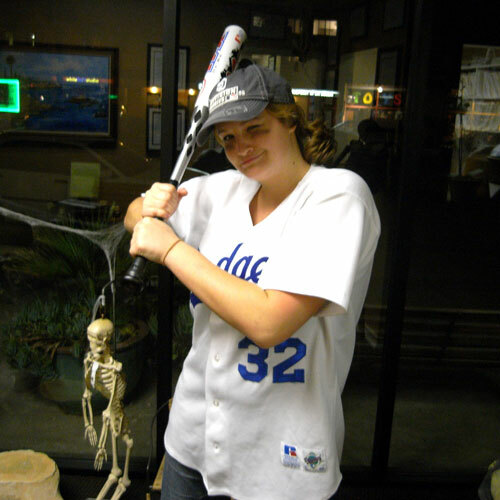 I am going to be writing more about this whole chiropractic blood pressure connection over the next week in our San Diego chiropractic blog right here. If you are trying to understand why this words, then a good place to start is our chiropractic cartoon books. If you want to see the video clip from ABC news, then watch it here. What are the drug companies going to think about how people are going to handle their blood pressure medication purchases? 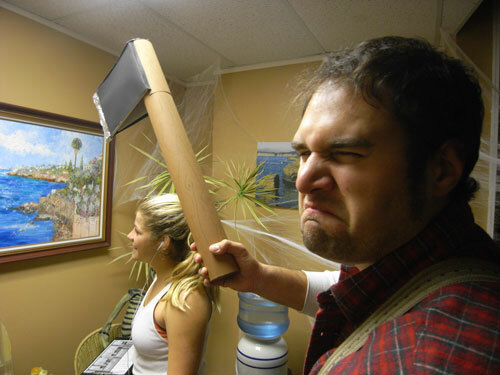 I predict they are going to freak out, and I would suggest chiropractic should prepare itself for another attack. No matter what anyone ever says, you can’t stop the truth. I am dying to hear what people think of this, so please comment below! Hunting for the perfect mattress. 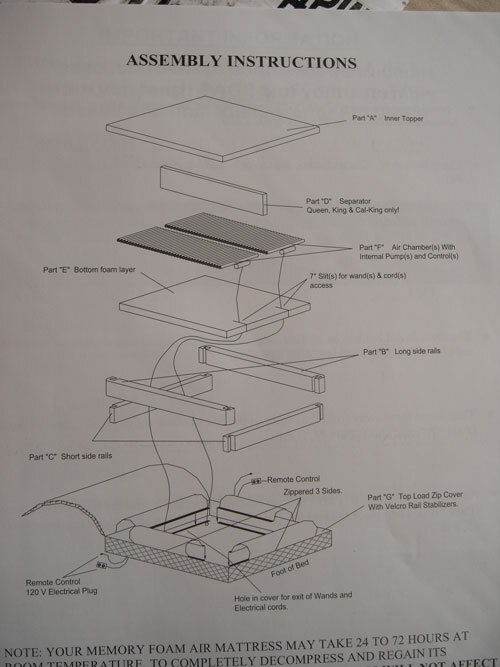 The following is the step by step photo construction of our new Sleep Innovations Mattress from Costco that appears to be what you would get if a Sleep Number Bed had an affair with a Tempur Pedic Mattress. 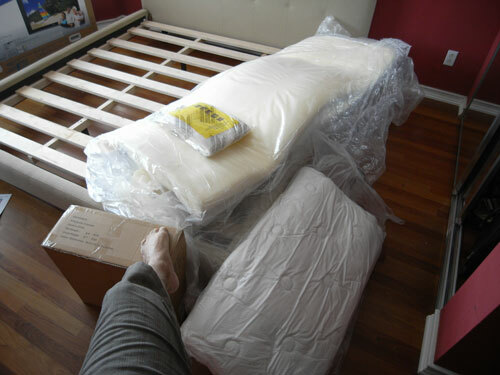 The first shot below is our new bed from Crate and Barrel. My wife loves it. 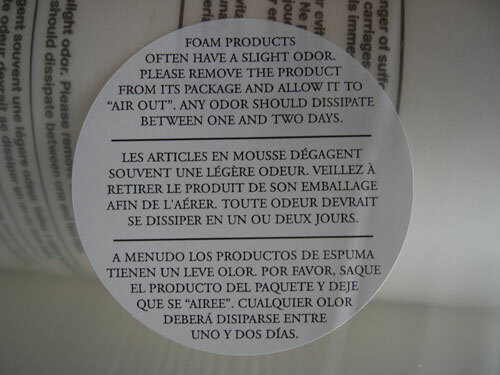 Then there is the warning about the memory foam smell. I had read a lot about this and was prepared for the worst. I have an extremely powerful sniffer that can pick up scents from across the house that others miss. I had to stick my nose into the foam to smell this warned of smell. Here is the whole box. It was about four and some change tall. 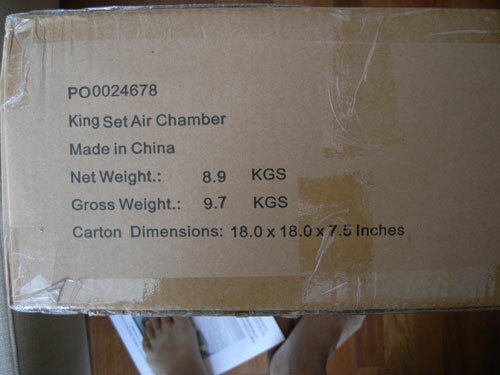 This is the company name on the box. 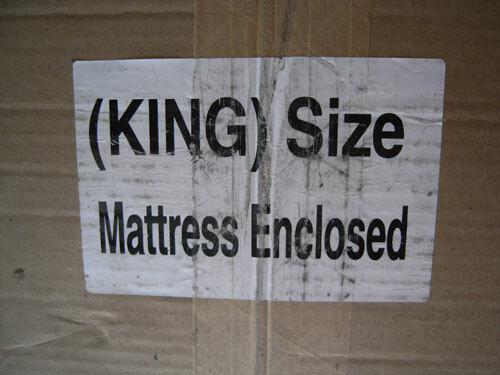 Here is the mattress size. They also had all others including California king which I think is longer and narrower than a regular king but I am not sure. This is why Americans better stop complaining and get to work twice as hard as they do now. Almost everything cool is made in China and we make what? Here are the fancy instructions. These did not impress me and caused me to waste about half an hour because the pictures were not nearly as clear and cool as on this blog. This is the only picture of the little controller gizmos. Here are more of the instructions. Why they don’t have a photo step by step online like this one is beyond me, or maybe they do and I just don’t know it? Here is the mattress sock. To understand the construction of the whole thing, think of a thin sleeping bag with fabric about as thick as a sheet, with a bunch of stuff crammed into it. That is the construction of the whole mattress. 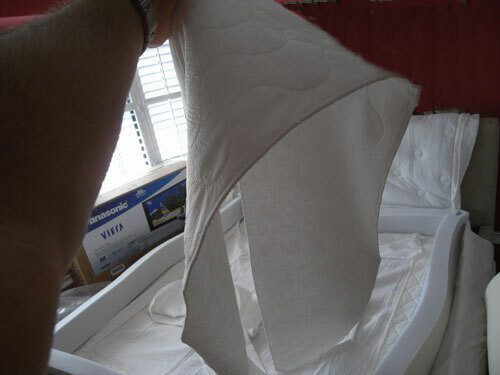 Here is the mattress sock unfolded and unzipped. I broke one of the zippers on the mattress sock by the way on the final zip, but the bed still works fine. When I get around to it I need to get a replacement sock. By the way, at the beginning of installation find the holes in the sock near the head of the bed. The directions don’t tell you to find them until the end when it is impossible to find them. This caused me to rush at the end because i wanted it done before I left for work. If I had found the holes at this point, it would have made it much easier, and possibly saved a zipper broken from me rushing. 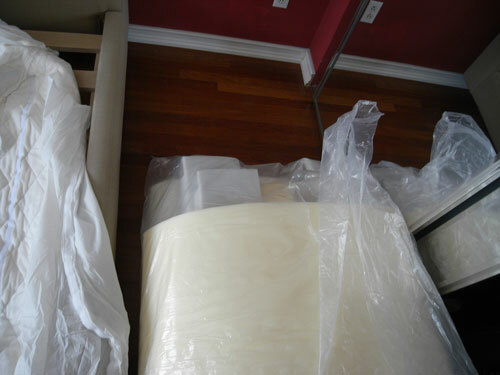 The next item which are these foam 2 x 4 thingys’ were in the middle of the tempurpedic-like mattress material crepe. It was a pain to get them out just because I was running out of room. Here are the foam board thingys laid out. You fit the four foam things together to make some sort of a structure. Then there is a fabric piece that wraps around the very outside of the foam boards that are now in that square above. The corners lock together as if it gives them some structure, but basically the only real structure comes from the air you fill it up with at the end. Otherwise it was like building a crepe out of smaller crepes. Here are all of the corners locked, with the fabric strip around the outside. I was never sure if I get the fabric strip just right or not, but it is a piece of fabric for gosh sakes, and I could never figure out what it was for anyway? Then you flip over some flaps of the original sock to sort of hold the foam board thingys in place. You then put a piece of foam with slits in it on the bottom. Later on you will realize those slits are for the cords from the air bladders. Here is the air pump and one of the air bladders. It is a fricken air mattress! It is actually of apparently the same construction, and the same material as the Coleman air mattress I bought at Target a few years back. Who’s ready to go camping! Yayyyyy!!!! In many write ups about the Sleep Number bed I heard complaints about a foam wall between the air mattresses. 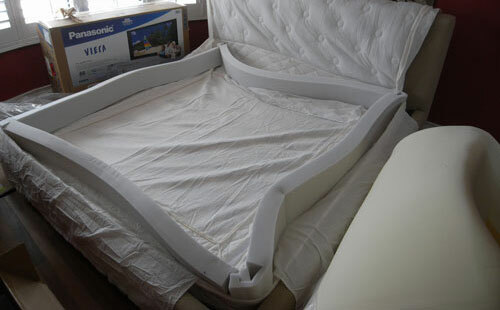 In this case they made it wide, and it tapers down to be very narrow between the air mattresses. There is no hard edge on this center piece of foam anywhere, so I think they fixed the error that others had experienced in the Sleep Number bed. You then take the cords under the mattress and thread them through the holes in the head of the sock, which are now impossible to find unless you found them at the beginning. 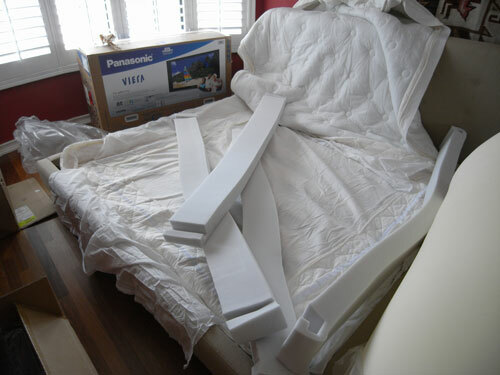 You can also see the final piece of memory foam that is about to be laid out over the mattress. I was rushing at this point so threw it on and started zipping. Then I folded the top part of the sock that you see folded over the headboard, and then zipped the whole thing up too fast and broke one of the zipper claps. The sock still works with just one zipper clasp. With the new fancy sheets. The early reports on this are heaven. From the first second it feels amazingly comfortable. We played with it and you can make it feel a little uphill or downhill if you fill one side more than the other. If you way overfill the mattress it can make you feel like you are sleeping on a pod that you might fall off of, as one other writer mentioned. 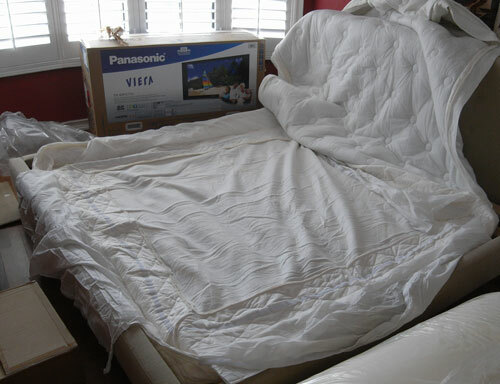 For us, so far the bed is wonderful, and I will do a full write up on the sleeping on it soon. As far as the construction goes. This is a thick sheet sock with a piece of foam and some air mattresses in it. That is really it. It makes much more sense to me than a big heavy traditional mattress which is going to compress and wear out after a few years anyway. 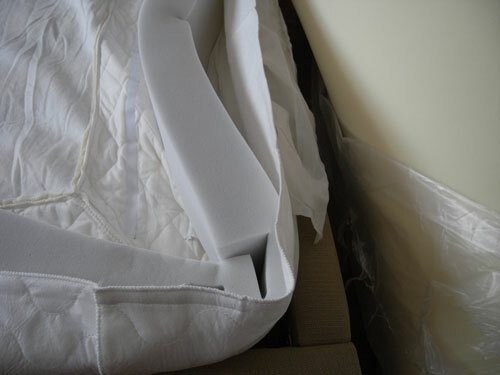 It is also very easy to move and remove if necessary because it is mostly fabric and air. How long will it last? I bet a few years, maybe five? Would I have been happy paying $3000 for it? Hell no. For $600 or $700 it reminds me more of an expensive jacket, but one that I will be wearing every night for 8 hours or more for the next three years. My final evaluation will come after more sleeping, but from all the analysis I have so far I will give it two huge thumbs up. To repeat my previous offer to Tempurpedic and Sleep Number. I notice that this blog is showing up very high in Google for your terms. So to be fair if you guys want to send me temporarily your best mattress to try, we can set it up in the guest room and I will be happy to give it a go and make an honest comparison. If it is better than the Costco one, then I will be happy to tell everyone that fact. And to my readers, please continue to leave comments. This site is gathering a lot of stories about these beds where the writer (me) and the commenter’s have not financial stake in the outcome of this discussion. 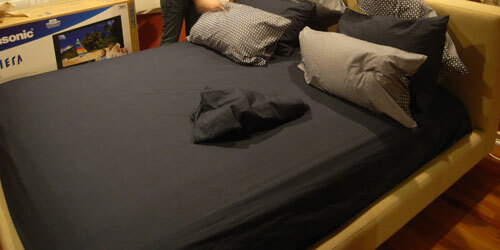 Here is a summary of all of the posts I have written about beds. Around 4 years ago, chiropractors were shocked and surprised when the law was changed in California so that if you were injured at work, you could at most receive 24 visits to the chiropractor. It should not be a surprise (but it is) that someone is taking on this arbitrary limit in California courts system. I for one have had injuries that have literally taken me years to heal, and in a few cases decades. I have seen plenty of patients who take years or decades to fully improve from some severe injury. This can involve them needing literally hundreds of chiropractic visits to reach their maximum improvement. The way the law works now, is that if you are at work, fall of a crane, break your spine, and severely injure the discs and muscles, that when the bones have healed from the fractures and you go to the chiropractor, you will be limited to 24 visits, unless the insurance company decides to give you more visits, which in my experience is so rare that I personally have never seen it. The following is an exerpt from a letter written by Roger W. Calton who is an attorney in Orange County who I have known for many years. The challenges in this case are very interesting. The California Constitution creates a complete system of workers compensation which is to include “full provision for such medical, surgical, hospital and other remedial treatment as is requisite to cure and relieve from the effects of such injury.” The Legislature’s arbitrary 24 visit cap places, for the first time, a limit upon care which otherwise would be necessary to cure and relieve the effects of the industrial injury. If the Legislature can place a 24 visit cap on chiropractic, then could they lower the cap to 15 visits (as was the original proposal) or to 10, or to 5? Under the current law, the carrier can authorize in excess of 24 visits. But allowing the carrier to make this determination does two things: First, it creates a decision maker with an immediate and substantial bias. Secondly, it deprives the Court of the right to make the determination of what care is necessary to cure or relieve the effects of the industrial injury. I have been told by Roger Calton that the attorney representing the injured worker in this case is a former justice of the California Supreme Court, and that there is a possibility that he might win. Chiropractic has lost some serious battles in the past, so I don’t want to promote any lost causes. This one though I have been told has some real possibility of winning. From a morality standpoint, I feel it is a slam dunk. If a bus driver is injured lifting a patrons bag into the hold of the bus, I really think the employer should cover whatever is needed to help them fully recover. Legal note: As in all things I have made my own attempts using sources I trust to verify the above. I aint no attorney, and the above sure as heck is not legal advice. If you are interested in the above matter do your own research and check out the facts especially before donating any money. Here is the courts website so you can continue your research there. This article is about an error if you use Turbo Tax to get a deduction for your HSA, (Health Savings Account), and you did not have the High Deductible Health Plan for the entire year. If you don’t have an HSA yet, don’t bother read this article, but you should learn about HSA’s because I think they benefit almost anyone in our country at this time. Here is how the error comes about. If I am understanding the U.S. Department of Treasury properly it should go like this. If you have an HSA, and you qualify for the HSA deduction in every other way, and you had your High Deductible Health Plan in place by December 1, 2007, then you should get 12 months of deduction from your HSA. If I understand this correctly, you should be covered even if you did not make your contribution until the last possible second, and you had your HDHP (High Deductible Health Plan) in place by December 1, 2007. 2. Enter the number of months you had this high deductible health plan. If you were in the plan on Dec. 1st. you are considered to be in the plan the full year. If you enter 12 at this point, then you get the full years deduction. As far as I can tell, this is what you are supposed to do, and what the Department of the Treasury wants you to do. If I understand things correctly, if you did not have your HSA on Dec. 1st, but you had it before then for a period of time, then you get some proportion of the months of the year. Also, if I remember correctly, the Dec. 1st coverage type deduction only applies if you keep the High Deductible Health plan until the end of 2008. I actually have met Bill Harris and know him a bit. He is the guy who started Chipsoft, which became Turbo Tax, and then got bot by Intuit who owns the program now. They are great guys and have made an amazing product. I have noticed that when the IRS changes something, such as the HSA’s which are relatively new and often changing, that Turbo Tax takes a few years to get everything real smooth with the new thing. 15 years ago, when they operated out of San Diego I remember that just as tax season hit all the staff went into massive overtime mode to try to correct all of the issues that come up with the new tax laws. So, thanks for the great product guys, and please fix this little bug. If by any chance I am incorrect on my understanding of the tax code on this, then please someone scream and correct me! So I got some more 1099’s that arrived way late from some insurance companies that had paid us money. There were 4 more to be exact. I opened up Turbo Tax and went to the area in my Schedule C (for those with businesses), to enter the 1099’s. When I tried to enter the next one something weird happened, and the numbers did not make sense. It took me about 15 minutes to figure it out. What was happening was that as I would enter another 1099 misc, Turbo Tax would bump off one of the old 1099 Miscs as if it had never been entered. Now the average small business owner who really does not know taxes, and accounting well would have missed this. After entering 4 1099’s worth about $10,000 total, they would have thought that they were getting back another $3,000 or $4,000 they would not have been due. The IRS might have even refunded it, but then found it in an audit later. I guarantee that with this bug there will be many small businesses who receive lots of 1099-miscs under reporting their income. I for one would like a full refund of my Turbo Tax costs this year if anyone at Intuit reads this. By the way, I just updated my Turbo Tax software about 30 minutes before the bug occurred. So what do you do? I could not get the easy steps in Turbo Tax to fix this, so I had to go into forms view which most people don’t use. I then asked it to show my return, and I took a look at what 1099 miscs had shown up. I then asked it to add more 1099 miscs, and entered each of them manually. This is way beyond the average small business guy doing his taxes. I would think this will happen mostly to doctors doing their taxes with turbo tax, but could also effect people like truck drivers or others who get paid from a lot of sources. 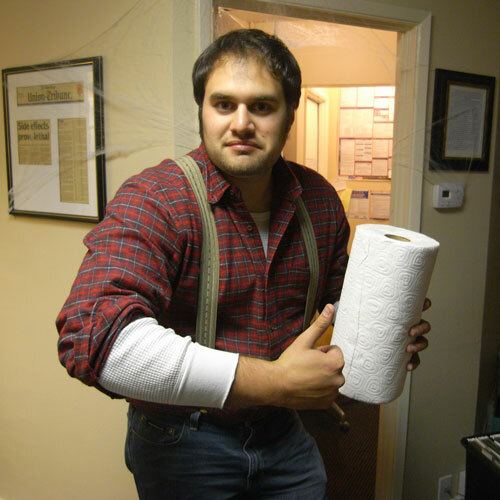 Check with your accountant before acting, and happy trails! It is interesting that in the search engines, my site ranks very high for Danactive yogurt. I was alerted by one of my readers today (thanks Ramona!) that Dannon yogurt is about to be sued for its claims about Dan Active yogurt. I love this product and use it almost daily. I can only judge it by my own experience. I have found that there is no better way for me to digest a meal than with a Dan Active. These comments and others are not being given as medical advice, but are instead based on my own personal experience. I wish the Dannon company good luck on the lawsuit, and I can only say that if a user of the product did not notice a positive difference after using the product, then why did they keep using it. We are not talking a massive investment of their income, but just a few dollars. Also, virtually any store if you do buy a few dollars worth of a product, and are dissatisfied with it, you can return it for a refund. This seems to be another case of people not taking responsibility for their own health. I use the product because it makes sense, and my digestion works better when I use it. If you don’t like it, don’t use it. If you don’t like the first package, return it for a refund. But come on. Do you really need to sue a company selling yogurt? Aren’t there worse enemies out there who need attacking? If you like this article, please link to it so others can read a common sense article about a tiny bottle of yogurt drink. Legal Disclaimer – This is not doctor advice, but my own opinion. Read all about stuff including yogurt drinks yourself before you use them, and make your own opinion. Well after much online mattress evaluation I ordered the Cal-King Nova Form Infinite Comfort Memory Foam Mattress from Costco. 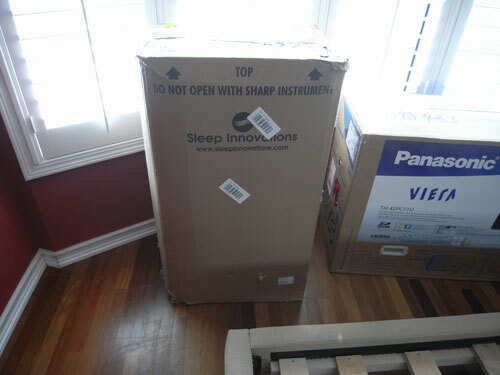 It has the tempurpedic like foam in the top, and the Sleep Number like air bladders inside. For around $750 on sale if it works it is a fantastic bargain, and if not a small waste of time. My biggest issue with Costco was what the return policy really is. I really wanted to know what Costco’s mattress return policy was. So I e-mailed back and forth and here is what the Costco employee said to my questions about the mattress return policy for Costco. Here is the first e-mail he sent back. It contains my questions with his answers to them. Thank you for your e-mail to Costco Wholesale. Can you also tell me if we order the mattress online, how much is the delivery charge? No delivery costs. How would we go about returning it if we were to do so? We offer two convenient return options. Costco.com refunds include shipping and handling fees. 1. For an immediate refund, simply return your purchase to any Costco location. To find a location, please click http://www.costco.com/Warehouse/Locator.aspx. 2. Please reply to this e-mail at customerservice@costco.com with the following information if you are unable to return the product to the nearest Costco location due to product size and weight. You will be contacted regarding your return within 5 to 7 business days. Please include your name, order confirmation number, phone number, and the reason for the return. I then sent an e-mail back to him asking him to clarify it a big and he replied. you will not be charged for the delivery or pick up of this item. So what I get from this is try it out, see if you like it, and if you don’t we will come and get it for no charge. Assuming this is true, then Costco just moved up another huge notch in my book. We will be getting the mattress this week or so, but will not be setting it up for a few weeks as we have to paint the bedroom. As soon as the new bed arrives from Crate and Barrel, and the paint is up, then we will be setting up the bed and trying it out. I will report back then! As you know from my other articles NO mattress works for everyone. 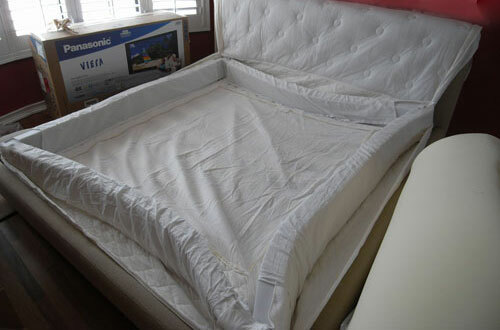 This mattress is currently making 90% of the thousands of people who are buying give it 5 stars. This is the mattress I currently recommend BUT read this entire page and related pages before you rush out and buy. As you know from my other articles NO mattress works for everyone. The only mattress I ever recommend is the one that you can easily return. You just don’t know until you sleep on it a few weeks. Costco stopped carrying their tempurpedic/sleep number combo type mattress so I have had to find other ones to refer people to. If you want to look at the reviews, here it is. Also this affordable mattress is also worth looking at. Boy has that been a load of study today! I will start off by stating that the below is a summary of data uncovered on the Internet, and that I have limited experience actually laying on the mattresses discussed. If you found this article by searching, I am a chiropractor with a crud load of experience and am very well connected to a lot of sharp people in the know. For me I have always thought about mattresses as the firmer the better. As my body has reached where it is now, 43 years old, and 233 pounds, I have found my needs have changed somewhat. 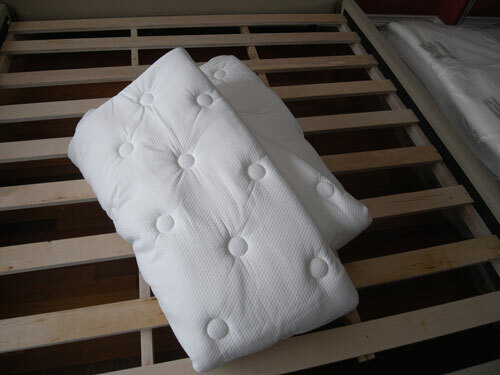 If a mattress is too hard, as my 14 year old Ikea mattress on a platform bed is, it begins to cut off circulation, and also cause painful pressure points. 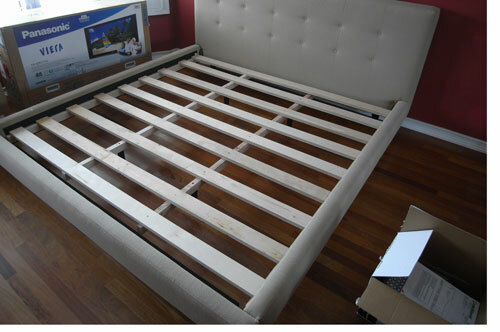 I must say that the Ikea mattress and slatted platform bed turned out to be great bargains that lasted a long time. Chiropractic is practically a miracle cure for a lot of things, but your bed can muck up a lot of it when you sleep. I will start off by saying that I never thought box springs were a good idea as you are using springs to try to create a flat hard surface. 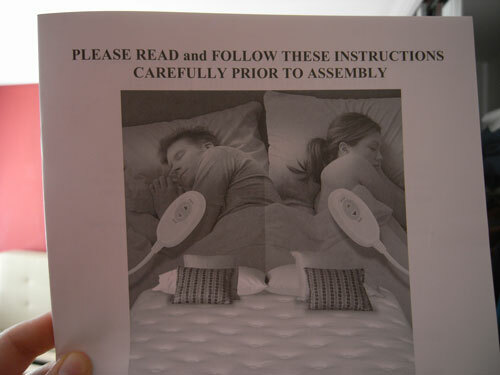 It appears that most of the bed manufacturers are starting to agree with my idea. So the below is all about the mattress, as we are going to buy a bed with a flat, hard platform on it. I spent about 4 hours today reading up on the current bed situation. For years I have been reading promotional material from Temper Pedic and used their pillows, and have watched Lindsey Wagner talk about the Sleep Number bed from Select Comfort for I think about 10 years. I like the Sleep Number concept because it sounds like the air bladder would never compress. It could pop right? But never be sorta half supportive, and half not. One of my patients who is a very, very smart man and has been the head of many companies, and has a very stiff back, told me that he has really liked his Tempurpedic bed, but that it is harder to roll over while staying in one place. 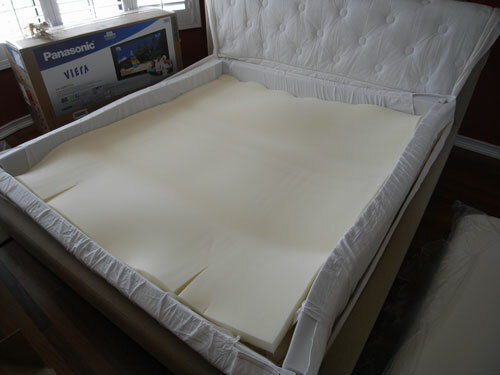 I have also heard that Temper Pedic beds tend to overheat people. I on the other hand have loved my tempur pedic pillows. The only problem with the pillows is that after 6 months, mine totally loses its support and becomes worthless. I used to be able to return them to Sharper Image and get replacements, but the last time I went there they said they could no longer do that. The memory foam in the pillow rocks, and really improves my neck. In fact I even take it with me when I travel. It just looses its cush and gets soft and unsupportive starting at about month 3 or 4 after being new, needs to be replaced after 6 months, and if kept for a year like mine is now, is fairly worthless for support. I do still prefer my worn out one to a hotel pillow, but this weekend I will be replacing my pillow. So I kept this known compressibility of Temperpedic memory foam in mind during my search. I started off at Consumer Reports website. I highly recommend this site, and for about $20 a year you can gather loads of information. To have accumulated the same amount of data as they had on mattresses would have cost me a hundred thousand dollars and taken a good year, so thanks Consumer Reports! They did some testing and came to the following conclusions. 2. If you lay on the mattress in your normal sleeping position at the store for 15 minutes and are happy, you will probably be happy after a month sleeping on the bed. Their actual study was a bit more complex than what I just said, so read it there if you want the details. 3. None of the Sleep Number, Tempur Pedic, or traditional mattresses are the best for everyone, so you need to do some more legwork yourself. The Sleep Number concept always made sense to me. They say they have a 20 year warranty, (more to come on that) so since it is simply a big bag of air the only thing that could go wrong would be a leak, right? With a 20 year warranty I couldn’t see how I could go wrong. I also liked the fact that you can adjust the firmness. I did a lot of Sleep Number Research today, and started the day off all ready to buy and spend around $2100 for the mattress without the frame. My wife has her heart set on a Crate and Barrel platform bed that takes a mattress on top, and that part is non-negotiable! I read on many sites, and really kept an eye out for reviewers and posters history. Were they long time posters on a site, or had they just registered and posted, which is an indication of paid posters who work for a company and will write well or poorly about a product to help their company. It seemed that some people just fell in love with their Sleep Number beds. There were also a surprising number of dissatisfied customers. I would say most of these appeared to be from people who did not do their due diligence before buying. So here is a list of downers for sleep number beds to watch out for. I am not saying they are true, but simply do your own research and know they may turn out to be problems. 1. 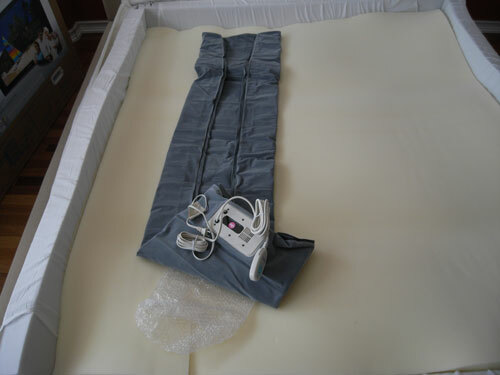 Sleep number beds are basically a plastic base, one or two big air bags depending on the model, a piece of foam that separates the two air bags, and a cloth sack that holds the two air bags. The cloth sack can have foam or other fluffiness where you lay directly on it so you will not feel the air sacks under you. One writer stated that he felt the only difference between the $1000 model and the $4000 model was the thickness of the foam you lay on top of. Plain old foam can be purchased for around a hundred bucks or maybe slightly more. One guy said when he saw it laid out on the floor in front of him just before he assembled it, he could not believe he had just paid as much as he had for what he saw. That is marketing. 2. The old version of the air bags tended to get moldy according to more than one author. It appears that if you call the company they will send you replacement bladders. The new versions apparently do not get moldy. 3. 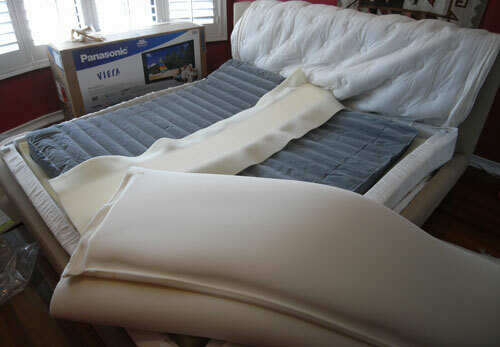 If you get the split bed with one side having a separate air bag from the other side, there is a foam divider between the air bladders. Some people complained that if you lay on top of this foam divider you feel it sticking up into you. Also over time one person said it breaks down and loses its ability to support weight. Also there may be a problem if you have the pressure set to one of the firmer mattress settings, that people tend to roll into the center. If one person has a full air bag, and the other one at a lower setting, then one person may tend to roll down hill away from the center. To be fair, I would have to sleep on one to make total sense out of this. 3. The settings can change while you sleep on them. More than one person complained that they would set the sleep number to a certain number, then later in the night they would wake up in pain, check the number, and find out the air had drained out and the number changed. I don’t know if this was a compressor problem, a setting problem or an air leak problem. 4. The warranty. It is promoted as a 20 year warranty which is what orginally sold me. If you read the warranty on their site it says that it is a full on warranty for manufacturer defect for 2 years. Then the fun begins. After 2 years you have to pay the first 20% of the cost of the replacement part plus another 4% for each year from the original date of purchase. That means if you return a part 3 years after purchase, you have to pay 24% of the cost. That should probably cover the Sleep Numbers factory costs in my guesstimate. After owning it for 10 years, you are paying 60% of the retail cost of the replacement, and are getting 40% off. At that point it sounds more like a sale to me on the replacement parts, than a warranty. 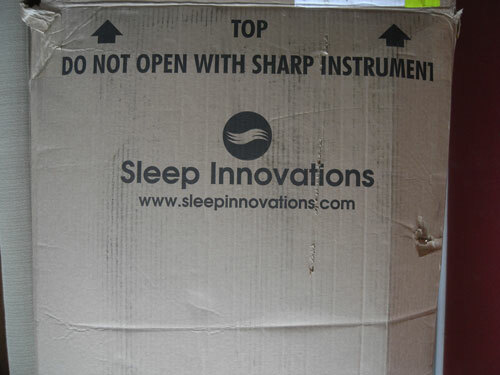 They also say they do not cover “mattress cover compression, foam compression” and a few other things. As I said about my Temper Pedic pillow, and my previous experience with foam, the reason they do not cover this is probably because any support created by the foam is gone within a few years. So my summary on the above, based only on reading, not on use, was that you are spending a few thousand dollars on a bed that you can really count on for maybe 3 or 4 years? On to the Temper Pedic beds. The base model for the mattress only starts at $1600. It would be totally worth it except for the fact that based on my own foam experiment with my pillow, I know the Tempur Pedic pillow only lasts about 6 months. For years they have sent me promotional info with discount pricing for the mattress and I almost bit many times. The pilow is a great product. I am sure the mattress feels wonderful to sleep on, as it does at the Sharper Image stores, but what about compression of the foam and the associated loss of support? If I read it correctly, it sounds like it means that you set the mattress on a flat surface and you check does it sag down more than 1″? Well, I weigh 233 pounds, so me laying on it is very different than a mattress sitting on the floor with nothing on it. You can have a 6″ high block of jello, and a 6″ high block of steel with nothing on them, but just because the block of jello is not sagging does not mean that it will support me as well as the block of steel. 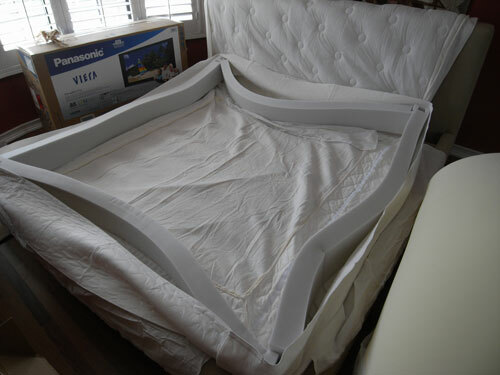 By the way if you are with Sleep Number or Tempur Pedic and want to correct any of the above I will give you an excellent way to do so at the end of this article. So my opinion on the warranties is that they know what they are selling you and how long it will last. If a company knows their product will last a certain period and they are sure, then they can warranty the product for that long. If you start having prorated warranties, it gives me a pretty good idea of how long the product is expected to last. If you consider that many retail products are marked up 100% to 400% or more, then my guess is that they consider the products to last maybe 3 to 5 years? Just my opinion. So what to do? The problem we were trying to get away from is that a traditional mattress only lasts 10 years tops, and maybe even less. I have some good connections with a friend who is very well connected to the origins of Costco , so I have some inside dope on the subject. My understanding is that Costco simply takes the price they buy a product at and increase it by about 10%. This is why I have recommended a lot of people to buy diamonds from Costco if you need to buy an engagement ring. Compare the prices if you don’t believe me, as they are roughly the same as discount Internet diamond sellers but from a company you can trust. I checked online at Costco and saw you could buy a good quality traditional mattress for around $750. So lets say that lasts you for 3 years. In that case you could get a new one every three years for 10 years, and it would cost about the same as a sleep number bed or a Temper Pedic. But what if you don’t like it? I just e-mailed Costco and am waiting for a response. From what I can read, if you don’t like it simply call Costco up and they will come pick it up if you bought it online. If you buy it from the store it appears they charge you a bit to come get it. I will blog about what they say back in their e-mail. Then I really started laughing when I found on the Costco site a mattress which is a two sided air mattress style, with 3 inches on memory foam on top. It kinda sounds like Sleep Number and Tempur Pedic had a little romance, and this is their offspring. It may turn out to be the princess and the pea solution. So if it works out, then it will be $750 for the best of both of the new luxury mattress solutions. And if it turns out to be a total piece of crud? Costco can come get it. If it only lasts a few years? 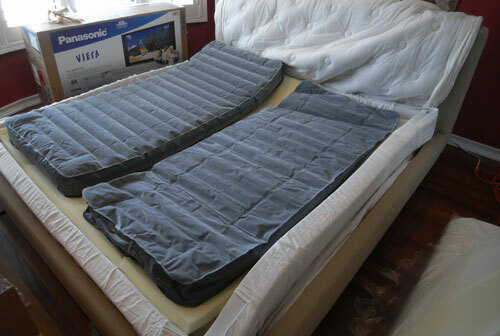 then it is no different from the reviews of the big money mattresses, at a third of the cost. Now to be fair to the big players Sleep Number and Temper Pedic. If there is any data above that is incorrect, please just e-mail me the correct data with the supporting document and I will change it. Would you like me to have my tens of thousands of readers here the real story? If you really think that I will be so blown away by the product that I will think it is worth the $2000, or whatever the cost is, and that it will really last, then send one over. I will sleep on it for a month or two or however you would like to lend me one, and then I will write my results. Based on what I read though, I would not want to purchase one until I have seen what it could do for a few years to really see the durability. By the way I think the next thing Consumer Reports needs is a longer study on the beds that goes at least a few years to test the durability. So to any of the mattress manufacturers, if you want to prove it to me, then just send me an e-mail and I will be more than fair with you. Otherwise I will be picking out a mattress from Costco in the under $1000 range over the next few days and trying it out on our new platform bed from Crate and Barrel. So correct me if I am wrong, and if you want me to test out your product and discuss it here send me an e-mail and we can discuss it. Much Love and sweet dreams! This is a directory to the posts I have made over the past week about the FireFighters I had the pleasure of dealing with. Please forgive the fun loving irreverent attitude of the posts, but that was the attitude exhibited by the fire fighters and it was contagious. It brought me back into my old ocean lifeguard state of mind. These guys were afraid of nothing, and risking their lives and having the time of their life while they did it. They were a grand example of the way to live ones life, full speed, laughing, full of love and appreciation. Thank you guys for one of the best weeks of my life!!!!! !This page will be updated with links to new pages I create related to the fire. 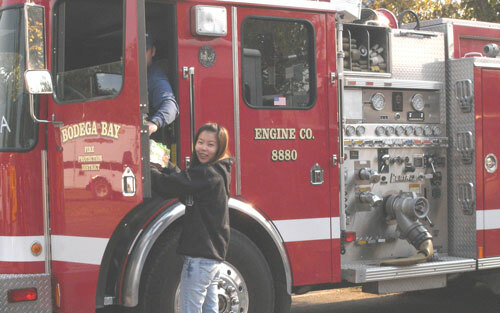 The adventure on Monday of Roseanna and I delivering chiropractic to fire fighters in Poway at the firehouses and having to retreat from the fire. We later found out at the last firehouse we were within 100 yards of the flames 🙂 It also has pictures of use getting stuck in evacuation traffic. Tuesday’s adventure going beyond the road blocks and checkpoints into the evacuated area in Rancho Bernardo to deliver chiropractic to the firefighters at the command post at the Longs Drugs parking lot. This was the day we we were told they had a food supply problem. Wednesdays adventure going back to the Longs drugs Rancho Bernardo command center, delivering the fresh squeezed juice and power bars my wife bought, and giving chiropractic to the fire fighters. This is also the first we saw of the National Guard. Wednesday nights adventure with my wife delivering around 70 Chipotle burritos to the San Diego firefighters in the dark of night, and adjusting people in the park who I could not even see, and our first stop at the full on FireCamp city at Kit Carson Park. Thursday’s trip with a small army to Kit Carson FireCamp to deliver 700 bottles of Naked Juice and giving chiropractic adjustments to firefighters from all over the western U.S. We also were filmed and photographed by the media, got to meet secret service guys preparing for the presidents visit to Kit Carson park, and even got a photo of me with a bomb sniffing dog. This is a huge Thank You to Kevin Kupper, the Pacific Beach Chipotle, and the Poway Chipotle for their huge donation of 70 burritos for the firefighters of FireStorm 2007. This is a thank you letter to Naked Juice for their instant donation of 720 bottles of juice when the firefighters desperately needed fresh healthy food. I have around 400 photos from the entire event and a bunch of video. I will be publishing more of it in the upcoming days. I am going to use this as the navigation page to the other pages. There is also a message from one of the firefighters that I promised to publish that will be put on in the not too far future. I also will be posting some ideas for low cost improvements that can be made to support the fire fighters better in the future. 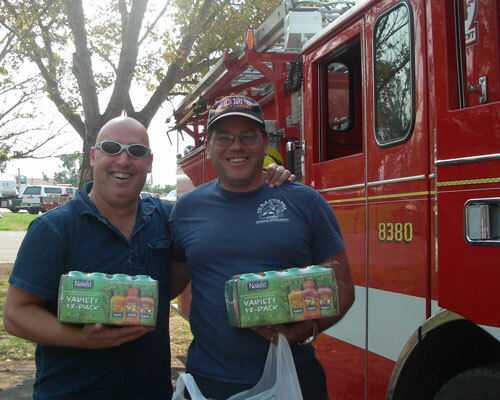 Naked Juice made a huge contribution to helping the fire fighters. 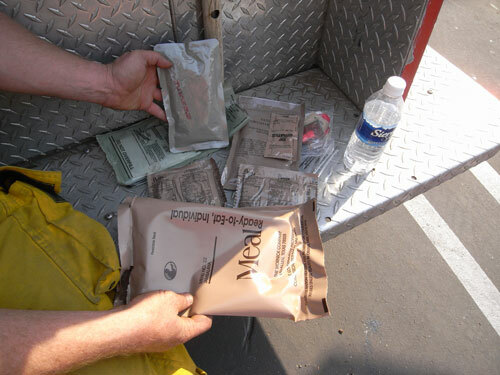 On Tuesday while doing chiropractic at the firefighter command center set up at the Longs Drugs in Rancho Bernardo, we were told by many of the firefighters that they had only received 2 meals in the past 48 hours. Their meal that they were eating when we saw them, which was the second in 48 hours, was a military M.R.E. That night I went for a walk with my wife on the beach and we talked about it. We decided that number one, I should go back again the next day to do more chiropractic, and two, we should bring some good food. We both agreed that the best thing we could bring would be fresh squeezed juice. While I wrote the blog for the night, my wife went to store to buy $200 of Naked Juice and another brand. The next day we handed out the $200 of juice within a few minutes. The guys and gals were thrilled. On Wednesday as we drove back from the fire zone, I called Jason at Whole Foods market in La Jolla who I have worked with for a decade on all kinds of projects. I asked for the San Diego contact numbers of Naked Juice. I called the product rep at Naked Juice who was in an airplane back east about to take off. She called me back before she took off and gave me the local number, I apologize but I forgot her name. I called the number she gave me and spoke to Brendon Graham. I briefly told Brendon the situation and that the San Diego fire fighters needed help, and they needed it now. He simply asked me how much? and what size juices? I asked for whatever they could give. He told me to send someone to their Miramar office at 6:00 A.M. and they would load up the back of a truck. 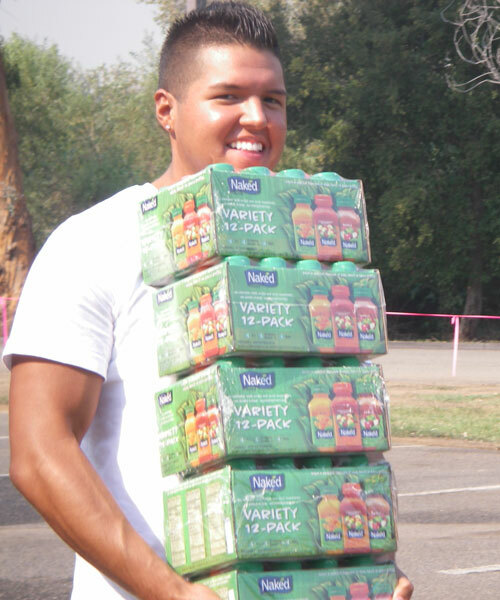 One of our patients, Amanda brought her husband’s pick up truck the next morning, and they loaded her up with 720 bottles of Naked Juice. We drove the juice to the Kit Carson park where the main FireCamp had been set up. 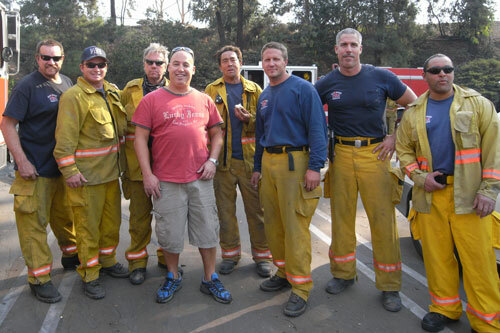 We immediately began handing them to the firefighters who were incredibly grateful. Can you imagine either coming back from fighting a blazing overheated fire all day, or on your way to one, carrying a case of icy Naked Juice? Now that is living! 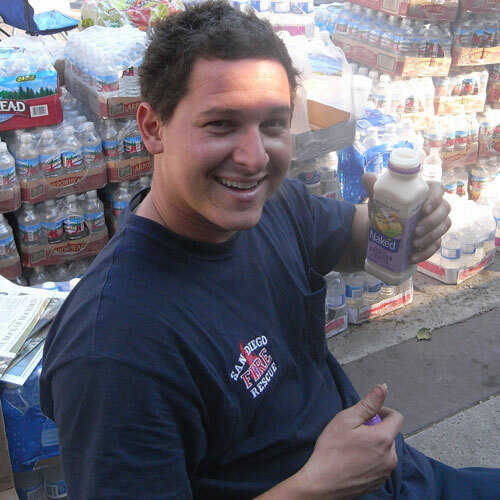 Super huge thanks to Brendon, the unnamed Naked Juice rep, and the entire company for producing the healthiest product in the whole world, and making it available without a seconds hesitation to the fire fighters who needed it. I have always loved Naked Juice for the tastiness of their product and its health value, but now they have earned my loyalty for their service to man.